Android, Google’s highly popular and growing Operating system, is a success. Aside from the iPhone it’s market share, especially in the US, is strongly growing. Reasons enough to make Tupalo.com fully available for your Android phone. As of today we’ve deployed and released our first Version of the Tupalo Android App. 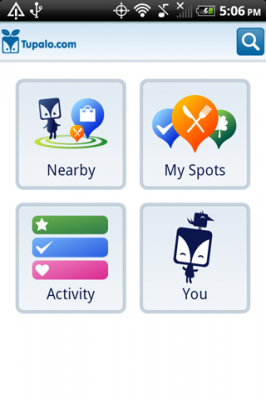 It’s a nifty, free app, that gives you all the tools to discover your neighbourhood. Browsing your favorite spots, adding them as favorites and even checking in at your favorite venue is supported. The beautiful code comes straight out of the hands from our mobile developer Ryan, who just moved from San Francisco to Vienna and now built one of the best local apps out there! Download the App by photographing the QR Code below or search for it on your Android phone! Hi. I stole this GA Visits for all visitors ruby script from our CTO. Hope you find it useful. It requires installed Ruby. Note: screenshot does not display Tupalo.com data, but data from another experimental domain. here is the code, all you need to do is to paste your profile-id into it. (the stuff after &id= highlighted in yellow). Showing love for the restaurant of your choice, or for getting the best teeth ever made from your close by dentist is important. The web transforms how such local businesses attract new customers, and how they are being honored for doing a good job. Besides from writing a review for such places, there is other ways to give them Kudos. Sharing it with your friends is probably one of the more efficient ones. And when it comes to “friends” there is no way around social networking giant Facebook. The controversial company that made worldwide friendship a phenomenon and made everybody friens with Kevin Bacon – by 6 degrees. Tupalo.com has now also a nifty, simple and elegant way of letting your Facebook friends know, how much you like a certain place. Now, you might ask, what about my not so positive experiences? The hair in the soup. The 45minute waiting time at your local hairdresser?